All three Cotswold Floorball League finals were played at the Fire Service College, Moreton in Marsh. The first two were between Bourton on the Water and St James & Ebrington. Bourton on the Water Girls had topped their qualifying table by a long way and were clearly the class team in the competition. In Lauren Jefferies, scorer of fifty one goals through the season, they had a potential match winner who was backed up by six team mates who made few errors. In their qualifying meeting Bourton had won 4-1. Despite this, St James & Ebrington went ahead early on when Isla Weeks-Coleman struck home during a power play. St James & Ebrington survived a power play mid way through the period and were able to attack straight away, Weeks-Coleman forcing Leila Soper into two quick fire saves. From the second of these the ball quickly went to the far end where Jefferies retrieved it and shot home from a narrow angle. It was only a few seconds later when Weeks-Coleman took advantage of being unmarked to put St James & Ebrington ahead once more. The two Graces were again in fine form Comben saving almost everything, assuming that it got past Bocock and defensive partner India Warren. Bourton put in a determined period of pressure in the last two minutes of the period and were rewarded when Jefferies slammed home a free hit with the help of a deflection off the wall. A chance for Bourton to go in ahead at half time presented itself when a penalty shot was awarded, but it was well saved by Comben. The second half opened with the Bourton power play still in operation, Isobel Tye making immediate use of it to put her team 3-2 ahead. Nine minutes into the period Weeks-Coleman and Poppy Warren forced Soper into two more saves which kept her team in the game. After a quiet time for her, Jefferies finally found her range, finding the corner of the goal from any angle, scoring three times in quick succession. Only two minutes remained when St James & Ebrington had a penalty shot in their favour. Weeks-Coleman was entrusted with the task and made no mistake. The chance of a comeback was still their, but only for a few seconds until Jefferies forced Comben into yet another great save and poked home the rebound for a 7-3 winning score line. The winning Bourton on the Water team: Lauren Jefferies, Isobel Tye, Jess Souch, Anna Wood, Amy Jones, Leila Soper, Min Kelly. During A Team Qualifying Bourton had won their match 1-0. The final was to be a much stiffer test and a reversal was on the cards. Bourton had much the better of the first period, tackling well in defence, but Jefferies putting them ahead during an early power play. She scored again midway through the period and a second title appeared to be well on the way. It took twelve minutes before St James & Ebrington could get a shot on target, but Joel Masters scored to make it 2-1. At the other end Jack Lacey was forced into a string of saves. His team forced a power play of their own, but Bourton stayed firm. In the second period St James & Ebrington again had a player consigned to the sin bin early on, but did not concede. This time it was their turn to have the better of the play. Jefferies thought she had scored once more when the ball pinged off the far post, but referee Josh Rushby ... who gave great performances in all three finals ... was in an excellent position to see what had happened. Masters gathered the ball amidst the confusion, worked his way up the pitch and shot home to level the scores. With ten minutes to go Bourton earned a free hit which Jefferies struck home as she has done so often, for a 3-2 lead. Both sides hit the post and both goalkeepers made saves. Bourton then suffered a double sin binning under a period of intense pressure which would normally see the demise of any team, yet they held out and even launched a couple of attacks. Once back to full strength Beale netted for St James & Ebrington, but it was disallowed for a high stick by David Rushby (father of Josh, a former GB Player and international referee) who also had a very fine trio of finals. Bourton defended resolutely, their opponents attacked fiercely, Masters eventually forcing the ball home to tie the match with just ninety seconds to go. Bourton had time to mount one more attack, winning the face off and forcing Jack Lacey into a match saving effort. Tied at 3-3, the match moved straight to the penalty shoot out. Masters, Logan Beasley and Billy Corner scored from their shots, but Bourton's first three attempts all went astray or were saved, leaving St James & Ebrington as champions for 2019. The winning St James & Ebrington A team: Oliver Beale, Oliver Haydon, Billy Corner, Logan Beasley, Tom Eastwood, Andre Inman, Joel Masters, Jack Lacey. A week later Dormer House B played probably their school's last game in the competition. The school has had a long and proud history in the sport, contesting fifteen finals, winning eight of them. Seven of those were in the 'A' Team competition, including six consecutive victories from 2001 to 2006. That record may never be equalled. They will be sorely missed. Their opponents were St James & Ebrington B, defending champions who topped the qualifying table by a long way. The match was summed up at the finish by Dormer captain Victor Scates when he said: "Your defence was like a brick wall". Only four shots got past that wall, which goalkeeper Joel Masters was able to collect easily. At the other end thirty four shots rained in and would have been even more if Rosie Campbell and John Scates had not been so hard working in defence. Will Droy made twenty seven saves, many of which would have beaten other goalies in the competition. Louis Grove scored early, with his team's first shot to settle the nerves. Alex Rawlings added a second soon after, tipping in Grove's pass at the far post. Dormer held out for a long spell yet could not prevent Rawlings scoring again from a rebound. The holders ran into penalty trouble either side of half time, only for the 'brick wall' of Jack Lacey, Oscar Keepence and Monty McMinn to perform to perfection. Once back to full strength Grove made it 4-0 only for another penalty to be imposed for high sticks. Rather than defend, Lacey kept attacking and wrapped around the goal for a 5-0 lead. At this stage the two girls in the team were given more playing time. Lacey passed across the goal, missing defender and attacker alike, allowing Tia Moore to shoot home. Moore was again on target when Isla Weeks-Coleman made the perfect pass from one corner to let her shoot home from a narrow angle. At 7-0 Dormer were determined to avoid any more concessions, mounting a couple of attacks, but unable to find the net. At the end of the season Lauren Jefferies topped the scoring list with sixty goals at an average of 2.1 per game. Isla Weeks-Coleman scored eighteen goals, with Lewis Martin (St Davids) in third place on fifteen goals at an average of 1.3 per match. Top goalkeepers were Joel Masters (0.1 goal conceded per game), and Andre Jeffrey (CCS-0.3 per game). Top girl keepers were Leila Soper , then Evie Hall (CCS), both on 0.5 goal per game. 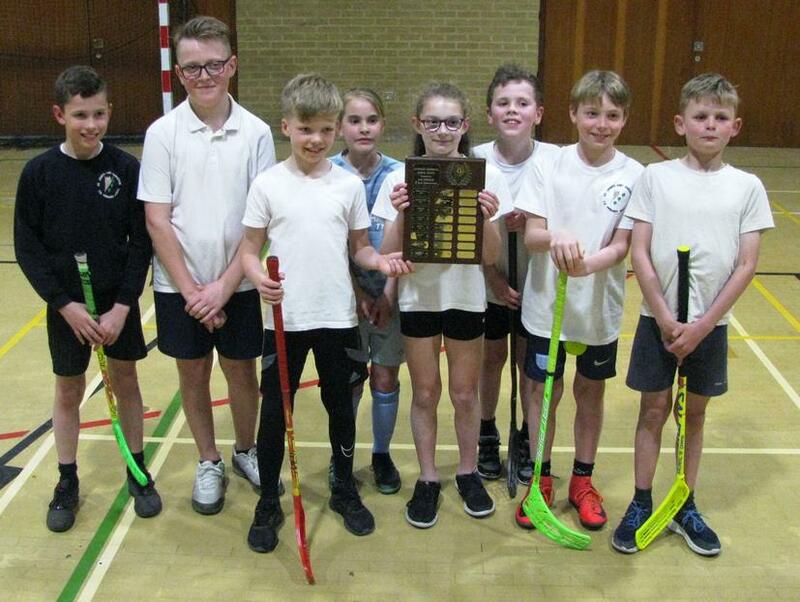 The winning St James & Ebrington B team: Isla Weeks-Coleman, Tia Moore, Oscar Keepence, Alex Rawlings, Monty McMinn, Louis Grove, Joel Masters, Jack Lacey.